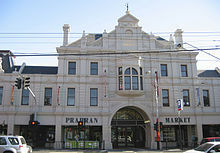 Prahran (/prɛ'ræn/, also known colloquially as "Pran") is an inner suburb of Melbourne, Victoria, Australia, 5 km south-east of Melbourne's Central Business District, located within the City of Stonnington local government area. Prahran recorded a population of 12,982 at the 2016 Census. 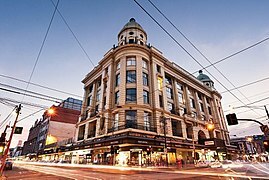 Prahran is a part of Greater Melbourne, with many shops, restaurants and cafes. The area of Prahran, centred along Commercial Road was one of Melbourne's gay villages, but no longer is. The shopping street Chapel Street is a mix of upscale fashion boutiques and cafes. Greville Street, once the centre of the Melbourne's hippie community, has many cafés, bars, restaurants, bookstores, clothing shops and music shops. Prahran takes its name from Pur-ra-ran, a compound of two Aboriginal words, meaning "land partially surrounded by water". The proximity of the Yarra River and a swamp to the southwest (Albert Park Lake is the remnant) explains that description. In 1837 George Langhorne named the area Pur-ra-ran, a compound of two Aboriginal words, meaning "land partially surrounded by water". When he informed the Surveyor-General Robert Hoddle of the name, it was written as "Prahran". 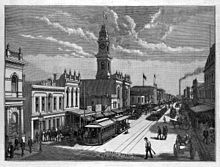 Prahran Post Office opened on 1 April 1853. Between the 1890s and 1930s Prahran built up a huge shopping centre, which by the 1920s had rivalled the Melbourne Central Business District. Large emporiums (department stores) sprang up along Chapel Street. Prahran also became a major entertainment area. The Lyric theatre (also known as the fleahouse), built on the corner of Victoria Street in 1911, burnt down in the 1940s. The Royal was the second old theatre built. The Empress (also known as the flea palace), another popular theatre on Chapel Street, was destroyed by fire in 1971. The site was operated by the cut-price clothes and homewares chain Waltons for the next decade and was later developed into the Chapel Street Bazaar. In the 1960s, in an effort to boost the slowly growing local population and inject new life into the suburb, the Victorian Government opened the Prahran Housing Commission estate, just off Chapel Street, together with a larger estate, located just north in South Yarra. Further complementing the high rise developments was a low density development between Bangs and Bendigo Streets. In the 1970s, the suburb began to gentrify, with much of the remaining old housing stock being renovated and restored. The area had a substantial Greek population and many took advantage of the rise in property values during the 1980s, paving the way for further development and a subsequent shift in demographics. During the 1990s, the population increased markedly, with demand for inner-city living fuelling a medium-density housing boom, which continues in the area, as part of the Melbourne 2030 planning policy. It was during the 1990s that solidification of the area's gay community occurred. Many gay and gay-friendly businesses (including bars, clubs and bookstores) were found along Commercial Road, between Pran Central and the railway overpass, the last of these closing around 2012. In Prahran, 61.2% of people were born in Australia. The next most common countries of birth were England 4.2%, Greece 3.5%, New Zealand 3.4%, China (excludes SARs and Taiwan) 1.6% and India 1.3%. Prahran is home to a large collection of architecturally significant commercial buildings, with many on the Victorian Heritage Register. 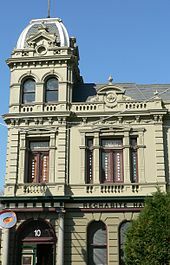 Prahran Arcade – Built in 1889 on Chapel Street, is a richly detailed building both externally and internally. Retains the original arcade, but decorative roof was removed in the 1950s. Also known locally as "Birdland" due to pigeons which once bred in the recessed balconies of the building and the large eagles which adorn the facade, but are now screened by chicken wire. Was a Dan Murphy's cellar for many years, but currently a JB HiFi store. Now heritage registered. Reads Emporium – Built in 1914 on the corner of Chapel Street and Commercial Road. A landmark of the area. Its twin beacons, which sit atop large copper clad domes, were once visible like lighthouses for miles around, but no longer operate. During the 1970s, the site traded as a department store under the name Moore's before the lower stories were converted into shops in the 1980s and named "Pran Central". The upper stories were restored and converted into fashionable apartments in 2005. Now heritage registered. Big Store – Built in 1902 and closed in 1968 on Chapel Street. A second store, almost as large as the main store, once stood in the carpark to the west, beyond Cato Street, linked by cross-over walkways. This large Edwardian building is currently used by Coles Supermarkets. Maples Corner – Built in 1910 on the corner of Chapel and High Streets. Converted into offices in the 1980s and many deteriorating decorative features were replaced with post modern elements. Love & Lewis – Built in 1913 on Chapel Street and converted into a mix of offices, retail and apartments in 2004. Now heritage registered. Other significant Prahran emporiums include Conway's Buildings (1914) and the large Colosseum building (1897), which was lost to fire in 1914. 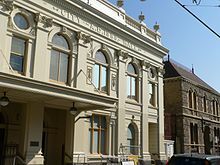 Other heritage buildings include the former Prahran Town Hall (now used as a library and council offices), the adjacent former City Hall (1888) (now used for special functions and as an exhibition space), the neighbouring police station (1887) and court house (1887) and Rechabite Hall (1888), in the Second Empire style. The Prahran Fire Tower (1889) is on Macquarie Street. State School number 2855, formerly Prahran Primary School (1888), on High Street was converted into apartments in 2005. St Matthew's Church, a large bluestone church on High Street built in the 1880s, was converted into offices in the 1980s. Residential Prahran consists of mostly single storey Victorian and Edwardian terrace houses, with some larger double storey terraces closer to the main shopping strips. Prahran features many small (largely hidden) gardens scattered throughout the suburb. The former Greville Botanical Gardens, now "Grattan Gardens", are off Greville Street, on Grattan Street. Subdivisions have caused incursions to what is now a narrow strip, with a playground and heritage pavilion. 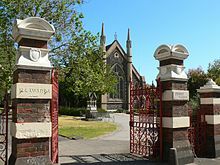 The Princes Gardens are a small garden, which features Chapel Off Chapel, an old church converted into a theatre, as well as the Prahran skate park, home to the best vert skateboarding facilities in Victoria. Victoria Gardens, off High Street, is a Victorian era garden, with a main space consisting of a circular row of London plane trees and an angel statue. The Orrong Romanis Park is the largest park in Prahran. Prahran is serviced by Prahran Station, on the Sandringham line, as well as trams routes 5, 6, 64, 72 and 78. Graham Berry – Colonial politician, and 11th Premier of Victoria, was a grocer in Prahran in the 1850s. Maurice Blackburn – Australian lawyer and Labor Party politician, who died in Prahran in 1944. Raelene Boyle – Australian athlete, who worked for the Prahran City Council as a landscape gardener. Keith Campbell, first Australian to win a Grand Prix motorcycle racing world championship in 1957. Barlow Carkeek – Victorian and Australian cricketer died in Prahran in 1937. Walter Joseph Cawthorn – Soldier, diplomat and a former head of the Australian Secret Intelligence Service (ASIS) was born in Prahran in 1896. Percy Cerutty – Eccentric athletics coach of Herb Elliott was born in Prahran in 1895. Arthur Henry Cobby – Leading air ace in the Australian Flying Corps during World War I was born in Prahran. John "Jack" Edwards – Test cricketer, was born in Prahran in 1860. Mark Evans (musician) – Bass guitarist with AC/DC from 1975–1977. Tony Gaze – WW2 fighter ace and first Australian racing driver to compete in an overseas Grand Prix, born in Prahran in 1920. Lisa Gerrard – Australian musician and singer, part of the music group Dead Can Dance, lived in Prahran. Lachy Hulme – Australian actor and screenwriter, lives in Prahran. Herbert Hyland – Investor and Country Party politician, was born on 15 March 1884 in Prahran. Gertrude Johnson – Soprano and founder of the National Theatre, born in Prahran in 1894. Chris Judd – Carlton Captain, has a luxury home in Prahran. George Hodges Knox – Australian politician, after whom the City of Knox is named, was born in Prahran in 1885. Sam Loxton – Australian Test cricketer, played for Prahran in Victorian Premier Cricket, later represented the area in the Victorian Legislative Assembly. Rebecca Maddern – ex Seven News presenter and now AFL Footy show co host. Dr. John Marden – Headmaster, pioneer of women's education, and Presbyterian elder, was born in Prahran in 1855. Paul Medhurst – Collingwood footballer, currently living in Prahran. John Safran – Documentarian and media personality. Sir John Armstrong Spicer – Attorney-General in the Menzies government, was born in Prahran in 1899. Henry Tate – Poet and musician, was born in Prahran in 1873. Brian Taylor – Former Australian rules footballer and coach of Prahran Football Club in the VFA. George Tolhurst – Composer. Composed the first oratorio Ruth, in the Colony of Victoria and first performed in 1864 in Prarhan. Keith William "Bluey" Truscott – World War II ace fighter pilot and Australian rules footballer, was born in Prahran in 1916. Harry Frederick Ernest "Fred" Whitlam – Crown Solicitor and father of Prime Minister Gough Whitlam was born in Prahran in 1884. 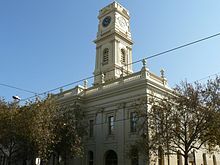 City of Prahran – Prahran was previously within this former local government area. ^ Australian Bureau of Statistics (27 June 2017). 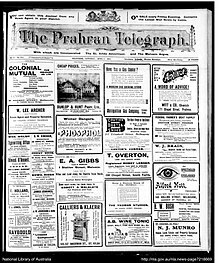 "Prahran (State Suburb)". 2016 Census QuickStats. Retrieved 21 September 2017. ^ "Prahran, Victoria". Australian Places. Monash University. Archived from the original on 21 August 2006. Retrieved 25 July 2013. ^ Premier Postal History. "Post Office List". Archived from the original on 10 May 2008. Retrieved 11 April 2008. 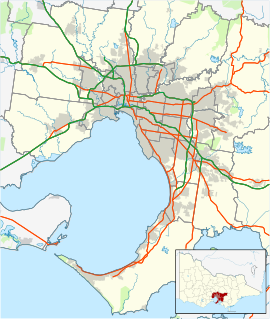 ^ "South Suburban Melbourne: 1854–1864". Victorian Historical Journal. 5 (20): 183. 1917. Retrieved 25 September 2013. ^ "George Negus Tonight – Raelene Boyle". Archived from the original on 20 October 2008. Retrieved 23 December 2009. ^ "Keith Campbell career statistics". motogp.com. Retrieved 24 November 2015.